A normal life in hacking, if there is such a thing, seems to follow a predictable trajectory, at least in terms of the physical space it occupies. We generally start small, working on a few simple projects on the kitchen table, or if we start young enough, perhaps on a desk in our childhood bedroom. Time passes, our skills increase, and with them the need for space. Soon we’re claiming an unused room or a corner of the basement. Skills build on skills, gear accumulates, and before you know it, the garage is no longer a place for cars but a place for pushing back the darkness of our own ignorance and expanding our horizons into parts unknown. It appears that Sam Zeloof’s annexation of the family garage occurred fairly early in life, and to a level that’s hard to comprehend. Sam seems to have caught the hacking bug early, and by the time high school rolled around, he was building out a remarkably well-equipped semiconductor fabrication lab at home. Sam has been posting his progress regularly on his own blog and on Twitter, and he dropped by the 2018 Superconference to give everyone a lesson on semiconductor physics and how he became the first hobbyist to produce an integrated circuit using lithographic processes. [Nixie] wants to make semiconductors at home, and that requires some unusual tools. Chief among them is a vacuum chamber to perform thin-film deposition, and true to the hacker credo his is homemade, and will soon be equipped with a tiny manipulator arm with magnetically coupled mechanical controls. If [Nixie]’s setup looks familiar, it might be because we featured his plasma experiments a few days ago. He was a little cagey then about his goal, but he’s come clean with his desire to make his own FETs (a project that is his 2018 Hackaday Prize entry). Doing so will require not only creating stable plasmas, but also the ability to move substrates around inside the vacuum chamber. Taking inspiration from the slender and maneuverable instruments surgeons use for laparoscopic procedures, [Nixie] is working on a miniature arm that will work inside his vacuum chamber. The video below is a 3D-printed proof-of-concept model in action, and shows how the arm’s segments will be controlled by cables. What’s really interesting is that the control cables will not penetrate the vacuum chamber — they’ll be moved right through the glass wall using magnets. Building a circuit to blink an LED is the hardware world’s version of the venerable “Hello, world!” program — it teaches you the basics in a friendly, approachable way. And the blinky light project remains a valuable teaching tool right up through the hardware wizard level, provided you build your own LEDs first. 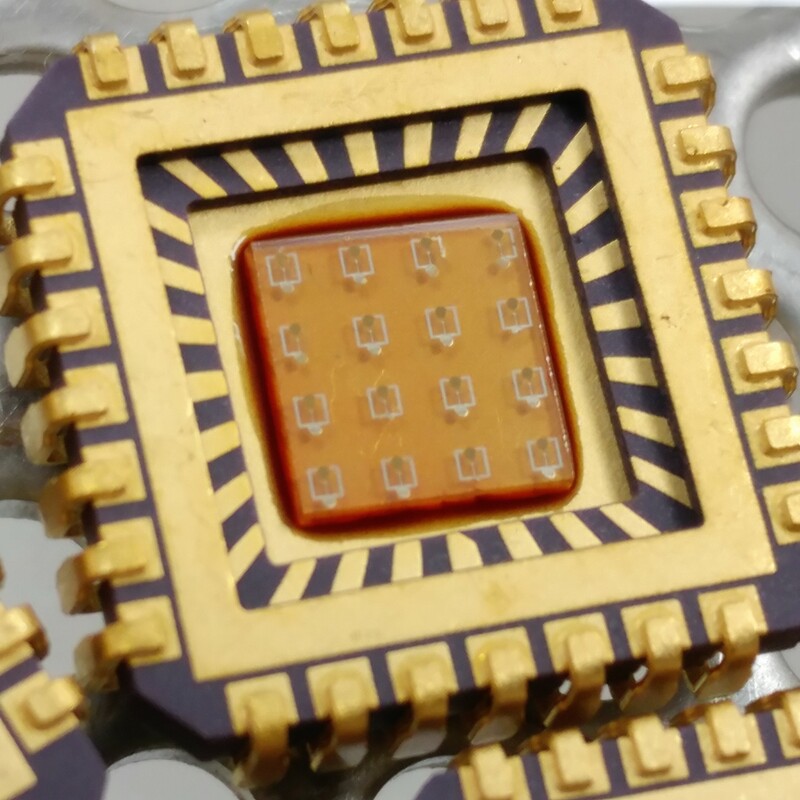 For [emach1ne], the DIY LED was part of a Master’s degree course and began with a slice of epitaxial wafer that goes through cleaning, annealing, and acid etching steps in preparation for photolithography. While gingerly handling some expensive masks, [emach1ne] got to use some really cool tools and processes — mask aligners, plasma etchers, and electron beam vapor deposition. [emach1ne] details every step that led to a nursery of baby LEDs on the wafer, each of which was tested. Working arrays were cut from the wafer and mounted in a lead frame, bonded with gold wires, and fiat lux. The whole thing must have been a great experience in modern fab methods, and [emach1ne] should feel lucky to have access to tools like these. But if you think you can’t build your own semiconductor fab, we beg to differ. Fair warning: [Justin Atkin]’s video on how to make plasma, fusors, and magnetrons is a bit long. But it’s worth watching because he’s laying a foundation for a series of experiments with plasma, which looks like it will be a lot of fun. After a nice primer on the physics of plasma, [Justin] goes into some detail about the basic tools of the trade: high voltage and high vacuum. A couple of scrap microwave oven transformers, a bridge rectifier, and a capacitor provide the 2000 volts DC output needed. It’s a workable setup, but we’ll take issue with the incredibly dangerous “scariac” autotransformer, popularized by [The King of Random]. It seems foolish to risk a painful death mixing water and line current when a 20-amp variac can be had for $100. A decent vacuum pump will be needed too, of course; perhaps the money you can save by building your own Sprengel vacuum pump can be put toward the electrical budget. Vacuum chambers are cheap too — Mason jars with ground rims and holes drilled for accessories like spark plugs. Magnets mounted below one chamber formed a rudimentary magnetron, thankfully without the resonating cavities needed for producing microwaves. Another experiment attempted vapor deposition of titanium nitride. It’s all pretty cool stuff, and we’re looking forward to more details and results. While we wait, feel free to check out the tons of plasma projects we’ve featured, from tiny plasma speakers to giant plasma tubes. Artem Kashkanov has updated details to DekatronPC. Bernino Falya liked NPR New Packet Radio. Mike Cann liked Low cost / low power sleep / WiFi Camera. Marvin started following Hackaday Prize 2019 Hack Chat. itfanr liked Real-time Kernel (Preempt-RT) for Raspberry Pi . cyber has added Inexpensive function generator to function Generators.